Is that not THE best saying? 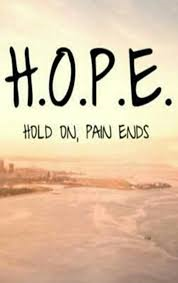 HOPE…Hold On, Pain Ends! I love it! This is what I am sending to my friends, hope. I told you I have a friend who got some news that they shared with me yesterday. Well, today I got to talk to them and hear their voice and once I did that, I let out my breath. When I finally talked to this friend tonight, I felt better. Please don’t misunderstand, I do not have any misconceptions that this is about me at all, and it shouldn’t be, but I am sharing my feelings with you, my friends. Don’t you have that feeling when you hear about a friend or loved one, sometimes one in the same, and until you see them in person or hear their voice, you can’t concentrate, can’t breathe? I felt that way with my sister and when I learn a friend is going through something and today, I took a breath. Now, I am sending HOPE and love and good vibes and love and hope and whatever else I can to another friend to for what they are about to go through tomorrow. This is something that they need and amazingly enough there is a family member who is able to give them what they need. I know it’s frustrating that you don’t know what or who I’m talking about, but I think it’s important to keep their private lives private, that they tell their own stories. I’ve known about this friend and what they are going through for a while and I value the updates I get and when I get to hear their voice, I hear hope and encouragement and faith and that is amazing. This friend will beat it and I look forward to seeing them soon so I can give them a hug and let out a breath, know what I mean? So, to my two very special friends, I send you love, hugs, encouragement, support and H O P E!